While Google Maps has many real world and practical applications, there have also been a few fun with Google Maps applications created. Listed here are some of the noteworthy ones. 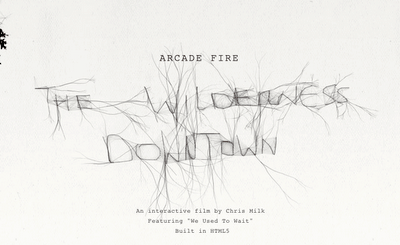 Set to Arcade Fire’s “We Used to Wait”, the Wilderness Downtown mixes in aerial and street View imagery in this Chrome experiment project. To start the film, type in your childhood home address (or any address in reality). The site takes a while to process the film and it’s recommended that you shut down any other applications running on your computer to make the experience more enjoyable. As the song progresses, the man running in the video gets closer to your house until the last views are of the address pulled from Google Maps and Street View. 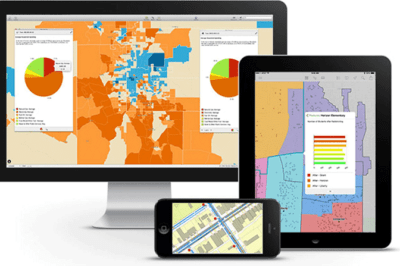 The application is designed to run using Google’s Chrome browser. If you’re a member of Google+, the recently released social networking service from Google, you can access a new addition to the Google+ Games collection. 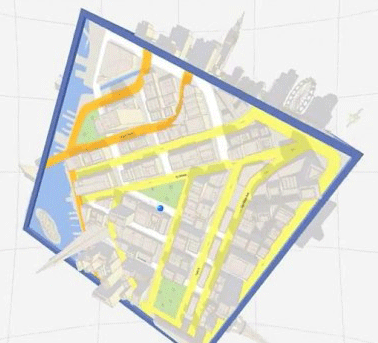 Released in May of2012, the game based on Google Maps was promoted in a short video clip. 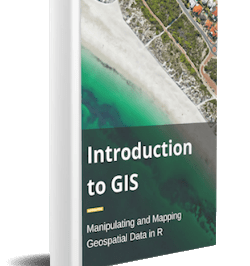 The game was developed by the Google Maps team based on WebGL which allows users to view 3D graphics without having to install any additional plugins (this technology was highlighted last October through GoogleMapsGL). With the tagline, “Play your world, like never before“, the game is set on a cube board that the user can tilt to navigate a small blue ball through various locations, both indoor and outdoor. Each side of the cube features a different geographic section of the world. The goal appears to be to hit various makers along the way. 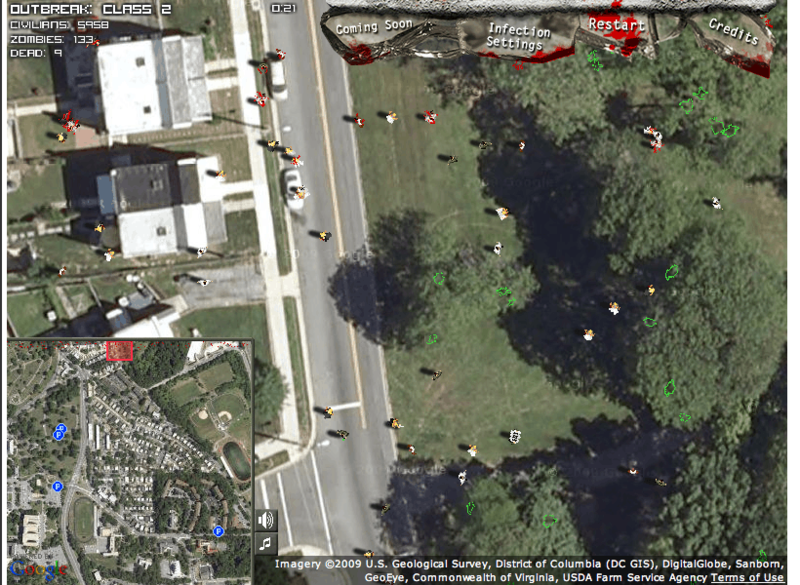 Game based on Google Maps coming in February of 2012. The end of the trailer is a pointer to the Google Maps demo page: http://maps.google.com/starthere. Created by insurance company, State Farm, this fun application mixes Google’s aerial and Street View imagery with the unfortunate and destructive visit by a menacing robot. Type in a name (optional) and the address you want “destroyed” and after about a minute of processing time, the short movie starts. The blockbuster style movie starts with an aerial view of the location you entered and extracts the neighborhood name from Google’s database to show a signpost of the location. Street View photos are stitched together to pan around the local area before the action starts. The application is a fun few minutes and is certainly a popular one. It would be interesting to see how many of those eyeballs actually click on the links at the end of the movie to continue on to State Farm’s web site. 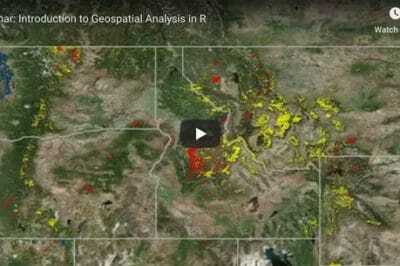 This is the latest of many interesting twists using Google Maps and other geospatial data. 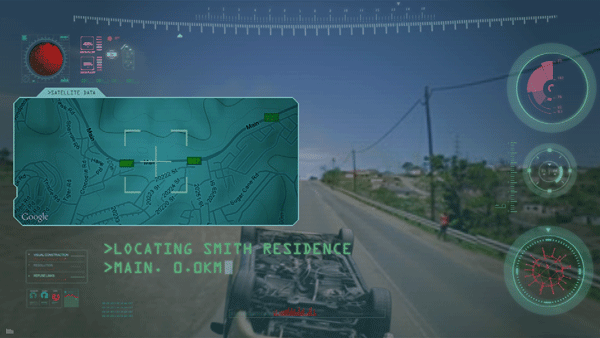 Jonathan Milott and Cary Murnion used Google Maps as a backdrop in creating a car chase short film. Radiohead used LiDAR data for the creation of their House of Cards video. Battlecell is a social wargame that uses Google Maps. Although no longer available, Serro.com used Google Maps to recreate car scenes from notable movies. There have been a few social gaming sites built on top of Google Maps that have come to my attention lately. Last week I posted about BattleCell, a game inspired by Risk and Starcraft where the world is divided up into 55 million cells. The objective is to capture as many neighboring cells next to your initial cell to build territories. Pueblo Village II also uses Google Maps as a base map. The objective of this game is to participate as a team of scientists that have traveled to Spain to locate the source of an anomaly (not clearly defined in the narrative about the game). The game operates in both Spanish and English. The English translations can be a bit confusing. ZOS allows players to unleash waves of zombies on the unsuspecting people of Washington DC. Players can tweak a number of zombie and infection variables such as zombie speed, infection rate, number of civilians and shooting accuracy to create their own version of a zombie outbreak. ZOS apparently is a prequel to an upcoming game called “Class 3 Outbreak“. Not a game but Dave of Sheepfilms has made a whimsical short video about the “dangers” of using Google Maps and GPS.